The graph below clearly shows the pattern of the annual real estate cycle for Toronto, the GTA in Ontario over the past 20 years. 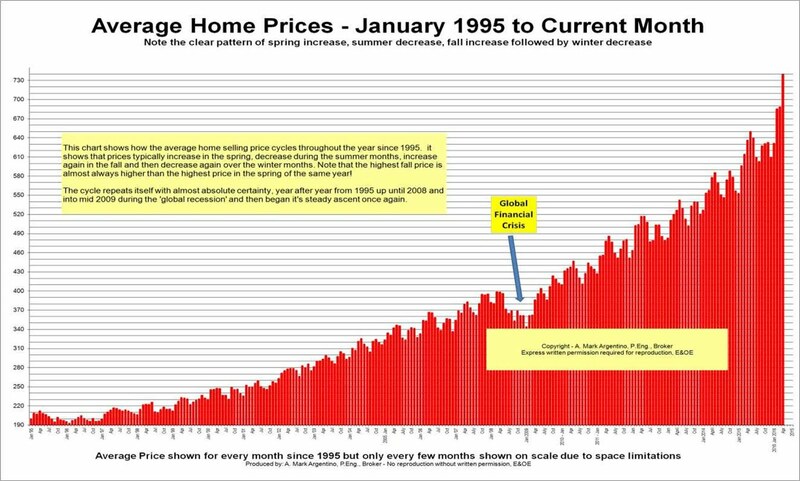 This graph shows the cycle of how average price increases in the late winter and early spring, decreases during the summer months, increases again in the fall (but usually not as high as the highest price in the spring) and then decreases again over the early winter months. The cycle repeats itself with near certainty, year after year and has done so since at least 1995. When will this regular price increase stop? Nobody knows for sure, but it's a very interesting trend to see the seasonal fluctuations in home prices.